An estimated 15,000 anti-austerity demonstrators gathered on McGill College Ave. on Oct. 3, 2015. After a turbulent year of strike mandates and anti-austerity demonstrations in the streets, the “Common Front” of public sector unions and Quebec’s Liberal government reached an agreement—in principle—over wages and pensions in late December, ostensibly putting an end to months of unrest. A couple weeks into the new year, however, there are already signs that the situation is far from resolved. There are rumblings that factions within the common front oppose the Liberal government’s latest offer, fearing that the proposed wage increase of about 10 per cent over five years won’t keep up with inflation and the cost of living. Another major hole in the tentative agreement is the lack of support from the Fédération autonome de l’enseignement, which represents 34,000 French public school teachers. As the FAE prepares to resume negotiations with the province, they’re also planning a large demonstration this Saturday to support “a massive reinvestment in public school,” according to a recent post on the FAE’s Facebook page. As the movement enters a new year, it may prove useful to reflect on the key demonstrations of 2015, events that sent the streets of downtown Montreal into chaos and garnered international attention. Presented here in chronological order are the top three protest highlights of 2015. While the Printemps 2015 protest movement was already well underway by late March, thousands of protesters took to the street for this peaceful student-organized anti-austerity demonstration. Riot police officers reinforced certain intersections, with the intent of blocking westward access to the busier parts of Ste. Catherine Street. Their tactics included baton blows, pepper spray and tear gas, which noticeably heightened the tension in the streets. Eventually, the protest made its way to Dorchester Square. As people marched in the direction of Ste. Catherine St., police gave a loudspeaker announcement declaring the assembly illegal under Montreal’s P-6 bylaw, as no itinerary had been provided. Roughly 30 seconds later, riot police waiting on Ste. Catherine St. charged at the massive group, leading to a stampede of hundreds of protesters seeking cover in the square. The chaos and confusion worsened when police deployed over half a dozen flash grenades directly into the crowd. As protesters split off and ran in every direction, riot officers gave chase, leading to an hour-long cat-and-mouse game in downtown Montreal. On the afternoon of April 8, the administration of UQAM called for police assistance in one of its campus buildings, where striking students were engaging in hard pickets to block access to classes. Riot police entered the university and carried out several arrests. In solidarity with the arrested students, several hundred activists gathered in the atrium of the J.A. de Sève university building to plan their response. By 7 p.m., it became clear that people would be staying put in the building to stage an occupation. Masked demonstrators gathered furniture and garbage bins to set up blockades at entrances and exits, and security cameras were smashed with hammers. One reporter and a photojournalist from The Link were inside the building to witness what happened next: a dance party with a smoke machine and strobe lights; anarchist protesters pushed back private security agents attempting to enter the atrium from an underground escalator; spontaneous soccer games were organized using empty beer cans as balls—anyone suspected of belonging to the media was quickly called out and forced out of the building. After a few hours, around 50 riot police officers descended on the protest, smashing a glass wall to gain entry to the occupied building. Protesters fled out of a back entrance onto Sanguinet St., where more police officers were waiting. Riot cops used tear gas, pepper spray and rubber bullets to break up the crowd. After an hour, the splintered groups were mainly dispersed, leaving behind a trashed university building and a fractured student body. 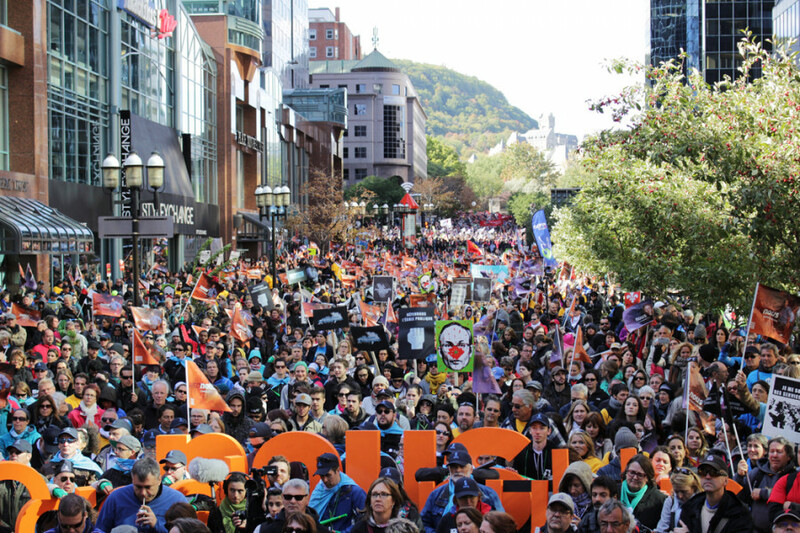 As part of May Day activities across the globe, protesters and union members from all over Quebec took to the streets of Montreal to speak out against the Liberal government’s austerity agenda. People gathered in Phillips Square at around 6 p.m., culminating in several thousands marching westward toward the downtown core. On the intersection of de Maisonneuve Blvd. and McGill College Ave., a heavy line made up of Montreal riot police and Sûreté du Québec officers was blocking westward access, and many protesters at the head of the march became agitated. As heated words between the marchers and police were exchanged, some of the more militant activists made their move: a lit flare was launched in the direction of police, and one individual emptied the contents of a fire extinguisher, obscuring the riot line’s view of the intersection. After a tense, minute-long standoff, the march continued down McGill College Ave. toward Ste. Catherine Street. Things escalated further once protesters arrived at the intersection: a group of riot police charged into the middle of the march—splitting it in two—and launched tear gas at both halves of the demonstration. Thousands ran in multiple directions to flee the chemical irritant, and hundreds of early-evening shoppers, tourists and terrace patrons were caught in the crossfire. Several parents were seen running away from the scene with their children in arms, and many activists rushed to pour milk in the eyes of a child that was painfully tearing up from the gas. Anarchist and activist groups on social media are still abuzz about the police treatment they received in 2015, and there are no signs that the fervor behind the anti-austerity movement is being kicked to the curb in the new year along with all the discarded Christmas trees. With this continuing anger amongst anti-austerity activists, and the apparent schisms in the Liberal government’s negotiation tactics, it seems safe to anticipate more street demonstrations in 2016. Anarchopanda, the well recognized panda mascot symbol of the Maple Spring movement of 2012 and ardent supporter of protest rights in Quebec, affirmed the right of activists to take the streets in an interview last November. “Streets are where protests happen, and it’s not up to the police to determine who can use the street for protests and who cannot,” Anarchopanda said. For their part, the police have argued that protesters’ rights to march must be balanced with enforcing law and order. One senior SPVM official involved in coordinating riot police deployments told The Link last year that officers are required to intervene with force when protesters threaten public safety, or pose a danger to officers on the ground at protests. But as it’s been seen time and time again, Montreal’s activists are not deterred by rubber bullets, batons, kettles, pepper spray and tear gas. As the austerity debate in Quebec rages on with no immediate end in sight, so too will the people take to the streets to make their voices heard.